Rebecca Caroline Ferguson (born 21 July 1986) is a British singer and songwriter. She came to prominence in 2010 when she became the runner-up of the seventh series of The X Factor, losing to the winner that year, Matt Cardle. She subsequently signed a joint record deal with Syco Music and Epic Records in the UK. She later signed to Columbia Records in the US. Ferguson's debut album, Heaven, was released in December 2011 to commercial and critical success. The album sold 128k in its first week and peaked at No. 3 in the UK Official Charts, making Ferguson the fastest-selling debut solo artist of the decade between the years of 2007 - 2017. Co-written by Ferguson, it was certified two times platinum in the UK and platinum in Ireland. The album yielded six singles including lead single "Nothing's Real but Love", which enjoyed commercial success throughout much of Europe and Oceania, entering the UK Singles Chart at number 10. A deluxe version of the album included the single "Backtrack", which entered the charts in October 2012 at number 15, giving Ferguson her second Top 20 hit. Ferguson's second studio album, Freedom, was released in December 2013. It met with positive reviews from critics and commercial success in the UK where it charted at number 6 and has since been certified Gold by the BPI. The album's lead single, "I Hope", peaked at number 15 in the UK. In 2012, she was nominated for two MOBO Awards and one MTV Europe Music Award. In 2015 Ferguson released her third studio album Lady Sings the Blues covering a number of jazz classics made famous by Billie Holiday. The lead single "Get Happy" was added to BBC Radio 2's playlist and the album charted at number 7, becoming Ferguson's third consecutive Top Ten charted album in the UK charts. The following year, Ferguson released her fourth studio album "Superwoman". The album reached number 7 on the UK charts, and gained Ferguson her fourth consecutive Top Ten album on the UK charts. She cites Aretha Franklin, Kings of Leon, Christina Aguilera and Amy Winehouse among her influences. Rebecca Ferguson was born on 21 July 1986, at Mill Road Hospital, Liverpool, to a father of Jamaican descent and white British mother. She spent the first two years of her life in Huyton. She has a younger brother, Sam. The family then moved to a house on an estate in Woolton Village when her parents separated. Ferguson received her primary education at Woolton Primary School and her secondary and sixth form college education at Gateacre Community Comprehensive School. As a teenager she later moved to Anfield. That was when she became pregnant with her first child Lillie May. Two years later she had her son, Karl. Ferguson has said her family supported her ambition to become a professional singer and helped her through two previous X Factor auditions. She also revealed that she was "bullied as a kid because my family was poor and I never had the right clothes or toys." Despite having a difficult start in life, the hopeful insisted she wanted people to focus solely on her talent. Ferguson also revealed that as a child she always wanted to be a pop star. She revealed on Loose Women that she was abused in a care home when she was 8 years old. Ferguson is a qualified legal secretary, having studied at Hugh Baird College, Bootle. She later commented, "when you have kids, you become a mum and forget about you as a person so I put my dreams of singing aside. There is only so long you can chase the dream when you are a mum. I wanted the kids to see me do well and be a better role model. They were always seeing their mummy fail. That was why I started college." Ferguson was mentored by Cheryl during her time on The X Factor. Ferguson had previously unsuccessfully auditioned for The X Factor and for P. Diddy's Starmaker in New York. She later commented "I went to other auditions, I was invited to New York to audition for P Diddy’s Starmaker and I was told ‘no’. It was really upsetting because I spent money to get there. I also tried out for The X Factor but it did not turn out too well, maybe because I did not have the confidence. I thought I would try Britain's Got Talent or The X Factor again and if that did not work out, I would have to think about what I was going to do." Ferguson sang "A Change Is Gonna Come" for her audition in front of judges, Simon Cowell, Louis Walsh and guest judge, Nicole Scherzinger. At her bootcamp audition, she sang "Like a Star" to which Cowell said "That is a recording voice!" and Scherzinger said, "I told you first time I saw her, she is our generation’s songbird." She sang "Fireflies" at judges' houses and was sent through to the live shows by mentor Cheryl and assistant will.i.am. For the first live show she sang "Teardrops" and in the second live show she sang "Feeling Good". In the third live show she sang "Why Don't You Do Right?" and in the fourth live show she sang "Wicked Game". In the fifth live show, Ferguson received a standing ovation from Cowell and Cheryl following her performance of "Make You Feel My Love". In the following episode, Ferguson received another standing ovation from Dannii Minogue and Cheryl after singing "Candle in the Wind". In the final, she performed a duet with Christina Aguilera, performing Aguilera's hit single "Beautiful". Ferguson's winner's song was a cover of Duffy's "Distant Dreamer", but she finished as the runner-up to Matt Cardle, making her the first female runner-up on The X Factor. After the final, it was announced that Ferguson had been signed by Syco Music. In January 2011, it was reported that Ferguson had signed a joint record deal between Syco Records and Epic Records. Ferguson and nine other contestants from the series participated in the X Factor Live Tour from February to April 2011. The tour saw Ferguson performing for 500,000 people throughout the UK. Ferguson released her debut single "Nothing's Real but Love" on 20 November 2011, which was written by Ferguson and Eg White. The single peaked at number ten on the UK Singles Chart. Her debut album Heaven followed and was released 5 December 2011 in the UK. The album features Ferguson collaborating with Eg White, Steve Booker, Fraser T Smith, Xenomania, Paul Barry, Mark Taylor and Brian Higgins. Ferguson later revealed that she would be co-writing the whole of her album in order for her to "connect" with the songs. The album would feature genres like Soul, pop and Blues. The album came to critical acclaim with critics lauding Ferguson for being the first credible artist to come from reality television format. Cowell also praised the album tweeting on 21 November how proud he was of Ferguson, "I am absolutely blown away by Rebecca Ferguson, her album and by her performance. Congratulations!". The album was certified platinum for shipments of 300,000 units by the British Phonographic Industry in its first two weeks of release. On 18 November 2011, Ferguson announced her first headlining UK and Ireland Tour, spanning 14 dates from 20 February to 13 March 2012. Due to high demand, Ferguson had to add more dates to her tour, all of which have sold out. Ferguson confirmed on her official website that the second single to be released from the album will be "Too Good to Lose". The single was originally meant to be released on 26 February but later pushed back to 4 March. The official video premiered on Ferguson's website on 2 February. The single release has been edited and shortened to make the track more radio friendly. Ferguson dueted with Lionel Richie on an ITV1 special entitled This Is Lionel Richie, in which she performed "Endless Love". Starting in February 2012, an excerpt from Ferguson's "Nothing's Real but Love" was used in a television advertisement campaign for Nescafé Gold Blend coffee. "Glitter & Gold" was confirmed via Ferguson's official website to be the third single taken from the album which was released on 29 April 2012. In April 2012, Ferguson broke her left leg during a night out, which kept her wearing a cast for several weeks. During performances on Britain's Got Talent and Alan Carr: Chatty Man, she performed while sitting on a stool. On 29 May 2012, Ferguson made her American television debut when she sang "Nothing's Real but Love" on The Today Show. She also performed the song on The View. On 13 July, Ferguson revealed via Twitter that she would be taking her management team to court, after they made her work until she collapsed. The relationship deteriorated further in September 2012 with the former management company filing a High Court writ, asking for a declaration that the star unlawfully ended her contract and seeking 20% of her future earnings. In an interview in March 2012, Ferguson stated that she expected to release her second studio album in 2014, that she would start writing the album in 2013 once promotion for Heaven had finished, and that she expected to take a more up-beat approach to the album. On 23 August 2012, Ferguson announced she would release a deluxe version of Heaven on 15 October 2012, and she would also release her fourth single "Backtrack" the day before. Ferguson performed Backtrack on the second The X Factor results show on 14 October. On 16 September, Ferguson released an EP of live tracks from the 2012 iTunes Festival, which featured five tracks including "Nothing's Real but Love". During an interview with Chart Show TV, Ferguson confirmed that "Shoulder to Shoulder" would be released on 9 December 2012 as the final single from Heaven before starting work on her second studio album. Ferguson performed the single on Chatty Man on 14 December. However, "Teach Me How to Be Loved" was released as the album's final single in Germany. Ferguson features on the charity record He Ain't Heavy, He's My Brother including other singers such as Paloma Faith, Paul McCartney and Robbie Williams. The single is to raise money for various charities associated with the Hillsborough disaster. The song achieved Christmas Number 1 in the United Kingdom. In October 2012, Ferguson stated she would embark on a US tour in January 2013 and that she had already begun writing new material for her second album. On 29 November 2012, Ferguson confirmed her plans to tour in the US and said she would release her second album late next year, stating, "I'm going back to touring the US more early in the new year and then I am getting stuck into writing the new album which should be out later in 2013 or 2014." She began work on her second studio album on 18 February 2013 after a month hiatus and completed the album in mid-August. In July 2013, Ferguson revealed she was in the stages of finishing up her second album, also saying that it "has been hard to make" and that she was writing about her babies. On 22 August 2013 she revealed on Facebook that her new album would be called Freedom and would be released on 2 December 2013 along with putting up pre-order links to the album. The lead single, "I Hope", was uploaded to Ferguson's YouTube channel on 12 October 2013 and was released on 1 December 2013, entering the UK singles chart at number 15; in mainland Europe "Light On" was released as the lead single from the album. Freedom was released the following day and entered the charts at number 6 and has since been certified Gold by the BPI. Freedom was met with generally positive reviews from critics. The album includes a duet with US soul star John Legend and production/songwriting from Jarrad Rogers, Toby Gad and Eg White. On 7 August 2014 Ferguson tweeted that she was back in the studio confirming the work of a third studio album stating "amazing day at the studio working with the same musicians that frank Sinatra used and so many other greats feeling very blessed". On 13 January 2015 Ferguson revealed the album title, artwork and release date via her Vevo channel. Lady Sings the Blues was released on 9 March 2015 via RCA Records. The album charted at number 7 on the UK Albums Chart. On 9 May 2015 Ferguson performed at VE Day 70: A Party to Remember in Horse Guards Parade, London. On 4 October 2015 Ferguson confirmed the creation of a new studio album by posting on Twitter that she is "busy recording" and "the next album sounds good already". The first single from the album was announced on 30 August and is called "Bones", a cover of a 2013 track by NZ artist Ginny Blackmore, and was released on 2 September 2016. The album "Superwoman" was released on 7 October. Ferguson toured from 23 October to 15 November across the UK. In December 2016 she was on Fern Britton Meets. In the interview Ferguson, the former teenage mum who became an X Factor singing sensation, revealed how her Christian faith got her through troubled times, both on the show that brought her overnight fame and in the years that followed. From being the victim of fraud to being left to bring up a child on her own, Ferguson says she is speaking out to help others. On 21 April 2017, she announced she was working on her next album, her fifth material. On 2 October, the same year she announced through her Facebook page that she was no longer with her management company but was working on new projects and touring in 2018. She released the first single "Uncrazy" from the album on 1 December 2017, a dance song, which moves away from Ferguson’s usual style of music. Ferguson met the father to her two oldest children, Karl Dures, on holiday in Tenerife, but had previously met[clarification needed] and known each other for some years. Ferguson and Dures dated for four years and had two children named Lillie May and Karl. She also has a daughter named Arabella, born in 2014, from a later relationship. Ferguson previously dated fellow The X Factor contestant and former One Direction member Zayn Malik, which caused controversy due to the six-year age difference. The relationship ended after four months together. In November 2011, Ferguson addressed the media interest, saying: "When I was in a relationship with Zayn it was quite hard, but it comes with it. Me and Zayn just grew apart. I wish him all the best." In 2011, Malik also commented, "Even though it was a mutual decision, when you have a proper heartache like that, I don't think you fully get over it. We're still friends and talk all the time." Kings of Leon (left) and Aretha Franklin (right) are two of the musical acts Ferguson draws inspiration from. Ferguson's first album is of the soul, pop, blues and R&B genres, with lyrics describing heartbreak and relationships. Her debut album's music was compared to work by Aretha Franklin and Macy Gray. On describing her own sound she said, "quite soulful, I don’t know what you compare it to. I’m just me." Ferguson cites Aretha Franklin as one of the artists who had the biggest influence on her. She says she draws inspiration from Franklin, whom she calls the "Queen of Soul". In an interview with MTV UK, when asked about being compared to Franklin she stated, "Aretha Franklin to me is like the queen of soul, so on one hand, I like being compared to her, but on the other hand, I don’t think I’ve achieved anything yet to be compared to someone who, to me, is an absolute legend. I’m literally just starting out and it's lovely and I feel really blessed that people are comparing me to her, but to me she’s in a totally different league... she’s Aretha, she’s like a soul diva. So hopefully God willing in the future when I’ve come to her age I will have earned that, but I don’t feel I have yet." She also revealed how she wished to have collaborated with Franklin on her debut album. She cites band Kings of Leon as an inspiration. On the question of collaborating with Kings of Leon she said, "I’d like to see what happened. I just think it would be cool, I love them as musicians and they play really well so I’d love to just write with them maybe...I’m dreaming here but you never know, I could rock out with the Kings of Leon." Ferguson also cites the late soul singer Amy Winehouse as one of her biggest influences, stating that she respected Winehouse as "she was real and wasn't in it for the fame, she was artistic and her music is lovely." She also cites Sam Cooke, Otis Redding and Nina Simone among her influences. Ferguson became the new face of Walkers crisps Sunbites as of June 2011. She starred in an ad that features her visiting her hometown. Created by AMV BBDO, the ad was launched across press, online, social media and TV. It became Ferguson's first ad as part of the campaign. Ferguson also opened her Beauty Boudoir in 2012 on Priory Road, Liverpool. The store is a reflection of the 1960s and is thought to be inspired by the beauty of the likes of Marilyn Monroe. Since 2017, Rebecca has been making guest appearances on ITV Loose Women her latest appearance was April 2019. ^ "EXCLUSIVE: X Factor finalist Rebecca Ferguson's family on the childhood that encouraged her to become a star". ECHO. 25 November 2010. Retrieved 16 December 2011. ^ "Rebecca Ferguson unveils new song 'Light On' - video - Music News". Digital Spy. 6 January 2014. Retrieved 10 August 2014. ^ a b "Rebecca Ferguson, Series 8, Fern Britton Meets... - BBC One". ^ Harris, Niomi (23 November 2016). "Loose Woman: Rebecca Ferguson reveals shock child abuse during emotional talk". OK! Magazine. Retrieved 23 November 2016. ^ "The X Factor 2010: the 12 acts who made it to the Live Shows". STV. 3 October 2010. ^ Freeman, Sophie (19 November 2010). "X Factor Tour 2010". Daily Mail. UK. ^ "Rebecca Ferguson". Rebecca Ferguson – New Album Out Soon. www.HMV.com. Archived from the original on 28 November 2011. Retrieved 10 September 2011. ^ "Cowell praise for Rebecca's return". Tv.uk.msn.com. 25 November 2011. Retrieved 10 August 2014. ^ "Rebecca Ferguson announces new single 'Too Good To Lose' - Music News". Digital Spy. 10 January 2012. Retrieved 10 August 2014. ^ "iTunes Festival: London 2012 - EP". The Huffington Post. ^ Michaels, Sean (23 November 2012). "Paul McCartney guests on Hillsborough charity single with Robbie Williams". Guardian UK. London. Retrieved 23 November 2012. ^ "Hillsborough charity single featuring Paul McCartney and Robbie Williams is tipped for Christmas No 1". Daily Telegraph UK. London. 23 November 2012. Retrieved 23 November 2012. ^ "Rebecca Ferguson: 'I can't wait to record new album'". Digital Spy. 22 October 2012. Retrieved 18 December 2012. ^ "Rebecca Ferguson plans 2013 US tour, new album". Digital Spy. 29 November 2012. Retrieved 18 December 2012. ^ "Work on the new album starts tomorrow i... - Rebecca Ferguson". Facebook. Retrieved 10 August 2014. ^ "Rebecca Ferguson proud of new album - RTÉ Ten". Rte.ie. Retrieved 10 August 2014. ^ "Timeline Photos - Rebecca Ferguson". Facebook. Retrieved 10 August 2014. ^ "Rebecca Ferguson: Soul Catcher". Bluesandsoul.com. Retrieved 10 August 2014. ^ "The Making of Lady Sings the Blues". VEVO. 13 January 2015. ^ "Ultimate Music - Rebecca Ferguson "Lady Sings The Blues" (iTunes+)". Ultimate Music. ^ "Rebecca Ferguson on the troubled upbringing that made her a star - 3am & Mirror Online". Mirror.co.uk. 2 December 2011. Retrieved 10 August 2014. 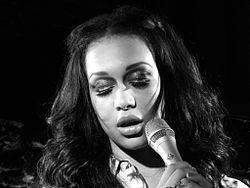 ^ "Rebecca Ferguson Biography, Picture Gallery & Video". heatworld.com. Retrieved 10 August 2014. ^ "Rebecca Ferguson shares first picture with her new daughter Arabella". Liverpool Echo. 28 October 2014. Retrieved 24 October 2016. ^ "Rebecca Ferguson: "Zayn and I Just Grew Apart, I wish him all the best." | Rebecca Ferguson | News | MTV UK". Mtv.co.uk. 24 November 2011. Retrieved 14 January 2012. ^ Nadia Mendoza (15 November 2011). "'I gave Peaches the wrong phone number!' Cheeky One Direction singer Harry Styles reveals he tricked Geldof'". Daily Mail UK. London. Retrieved 1 May 2012. ^ a b c "Rebecca Ferguson: "I Just Wanted My Album To Be Me" | MTV UK". Mtv.co.uk. Retrieved 10 August 2014. ^ "Rebecca Ferguson ditches nice-girl image in Walkers ad - Brand Republic News". Brandrepublic.com. 6 June 2011. Retrieved 10 August 2014. Wikimedia Commons has media related to Rebecca Ferguson. "Teach Me How to Be Loved"